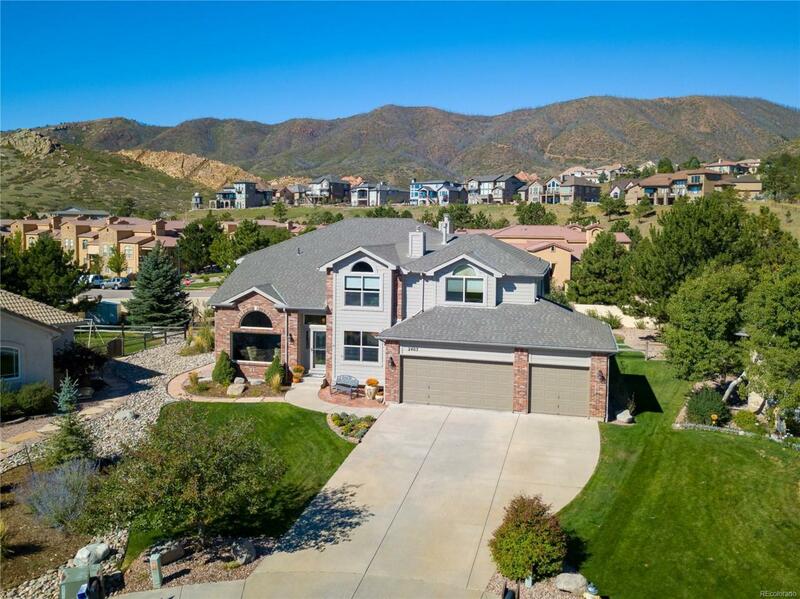 Located in the highly sought-after enclave of Chase Point - Mountain Shadows, high on a foothill yet has flat yards & roads, small cul-de-sac, near community trails w/award winning neighborhood schools. Dramatic curb appeal w/hogbacks & Rampart Range as your backdrop. High-end updates throughout, main level has high vaulted ceilings & windows, 3-story double-sided fireplace hearth, & beautiful hardwoods, office w/closet, 3/4 bathroom & laundry room. Gourmet kitchen w/custom cabinets, gorgeous slab granite & gas cooktop. Upper level has 3 bedrooms including the large master suite which includes an updated 5-piece bathroom, large walk-in closet & another double-sided fireplace connecting the suite to a loft. 2 bedrooms are serviced by a double vanity full-sized bathroom. Finished basement is perfectly laid out w/TV room, over-sized recreation room, an updated bath, 2 more bedrooms & unfinished storage space. Yard is nicely appointed w/great views of the mountains from the back patio.